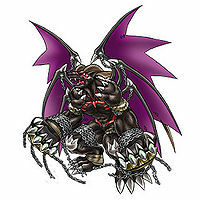 It is said that Belphemon awakens from its eternal slumber once in a thousand years, and regains its natural shape. 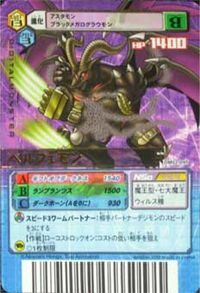 When Belphemon awakens from its slumber it changes into an incarnation of rage, and anything that enters its field of vision becomes a target for destruction. 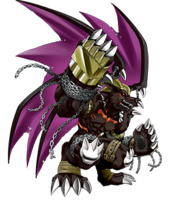 It is said that just by suffering Belphemon: Rage Mode's roar, Perfect Digimon and below will have their data disintegrated and die instantly, and not even Ultimate Digimon can escape unharmed. 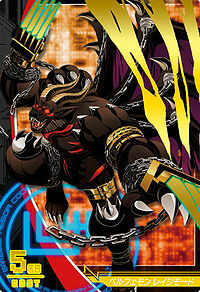 Its Special Moves are black flames cast from the chains coiled around its body (Lampranthus), and a slash attack which is unleashed from its claws, clad in the flames of hell (Gift of Darkness). 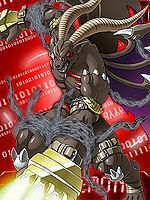 In addition, the data of Digimon consigned to oblivion by the Digimon crowned as the Seven Great Demon Lords is not reincarnated, but is sent to the center of the Dark Area, and becomes the flesh and blood of the Demon Lords. 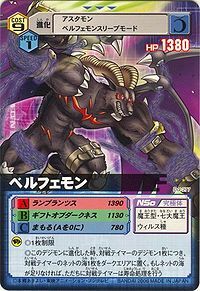 — Digimon Savers: "Demon Lord Belphemon is Revived"
Title: 「目覚めの咆哮」 — "Roar of Awakening"
| Belphegor (「ベルフェゴール」 Berufegōru) is a demon in Assyian mythology that tempts lazy people with inventions but these usually cause misfortune. | Rage (「レイジ」 Reiji) is a violent, explosive anger. 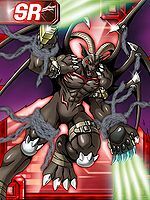 Lampranthus  ランプランツス Ranpurantsusu Dark Sigh Releases black flames from the chains coiled around its body. 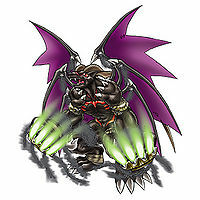 Unleashes a slash from its hellfire-wrapped claws, or gestures to drop a huge ball of dark energy on the opponent. 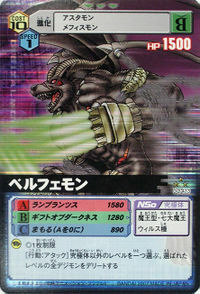 Rams the enemy with electrified horns. Rams the opponent with a headbutt. 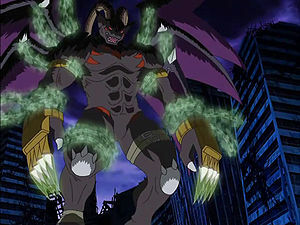 After Thoma betrayed Kurata and destroyed the device for controlling Belphemon Sleep Mode, Kurata digitized himself and merged with it, causing his clock to ring and awaken as Belphemon Rage Mode. 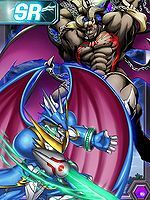 He was easily defeated by Shine Greymon Burst mode. 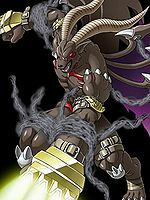 Appeared as one of the Seven Great Demon Lords. 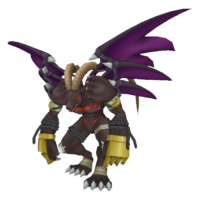 He is non-obtainable and cannot be evolved from any Digimon. 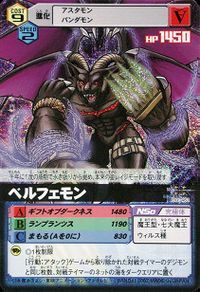 Appeared as one of the Seven Great Demon Lords. 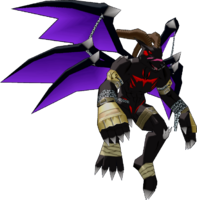 He is the first Demon Lord boss and is an obtainable evolution of Agumon. Belphemon: Rage Mode is an available Burst Mode Evolution for Belphemon: Sleep Mode. It can be unlocked if level 70 or above with the item Alarm Clock. 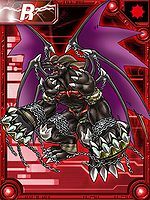 Belphemon can only be obtained as a collectible card. 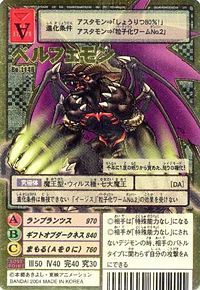 Its card is part of the Seven Great Demon Lords (七大魔王 Nanadaimaou) set. 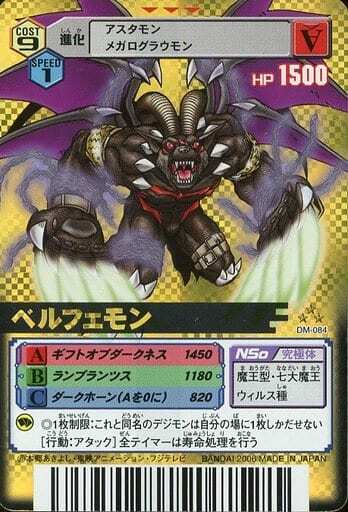 Can be obtained as a Burst Evolution of Mammon, or by using the ??? 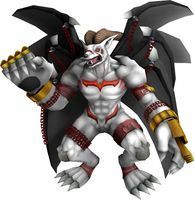 item on any Digimon Child level or above. 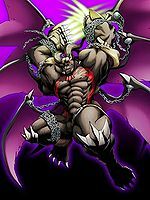 Can Burst Evolve into Lucemon: Satan Mode. 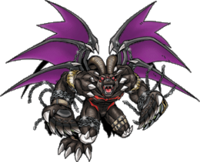 Belphemon: Rage Mode is an unobtainable Leader Digimon. 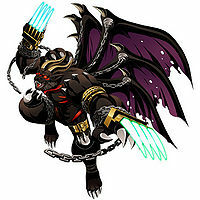 The Rage Mode awakens from its sleep once in a thousand years! 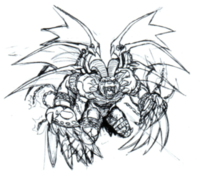 It awakens from its long slumber once every thousand years and returns to its original form, Rage Mode. 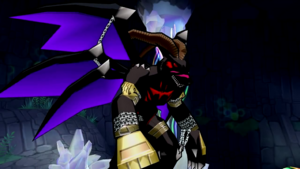 The data of the Digimon entombed by the Demon Lords become their flesh and blood. 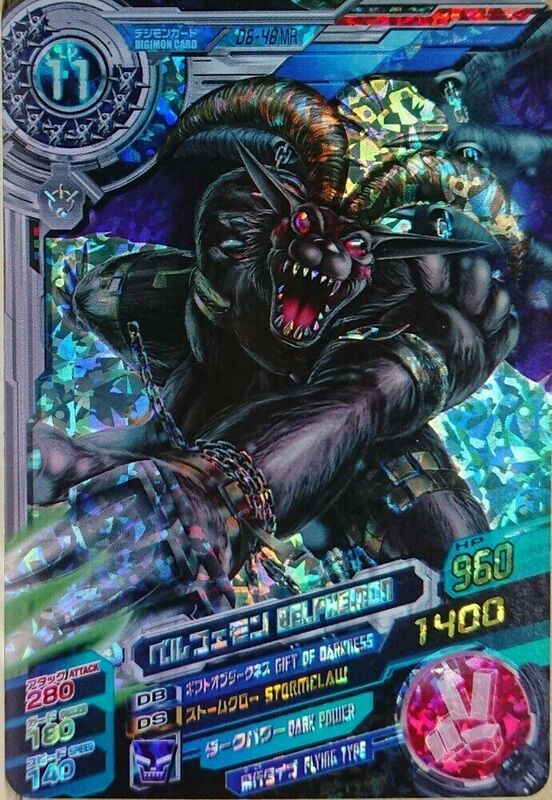 The Demon Lord Digimon who presides over the sin Sloth. 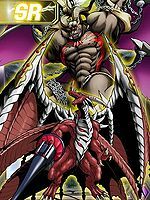 Although it stays in a constant state of slumber for a millennium, it is said that when it awakens, it will use its overwhelming power to destroy everything. 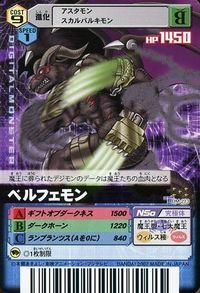 An incarnation of rage that awoke from its long slumber. 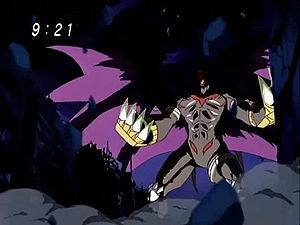 Its roar is fierce enough to disintegrate the data of Digimon with weak hearts, and it identifies anyone who steps into its field of vision as an enemy. 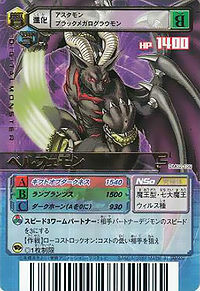 This page was last modified on 4 March 2019, at 20:24.